Made a beef dish yesterday for dinner and I’m pretty please with the result. As usual, I always have a tough time thinking of what to cook daily. Eating out is the same as well, sometimes you just do not know what to eat. After many days of spicy food, today I will just tone down a little on the spice. Last week a friend of mine from Singapore came to Manila for some business meeting and he was kind enough to email me and ask me if there’s any ingredients I needed from Singapore. I just asked him to get me a bottle of cincaluk, small bottle of dark soy sauce and a small bottle of sweet soy sauce that are not available in Manila. Being the cool dude that he always is, he bought me 2 bottles of cincaluk, big bottles of the dark soy sauce and sweet soy sauce. Thank you very much Kevin for the nicest gestures. Lets go on to our cooking tips on this beef dish shall we. As a kid, I hate bitter gourd. Most kids I think hate it but as I grew older, I began to appreciate the taste of bitter gourd. It’s bitterness is not really like medicine but has some distinct flavor. I do not know exactly the word to use to describe the taste, but the Chinese refer it to “golden bitterness”, almost like ginseng. 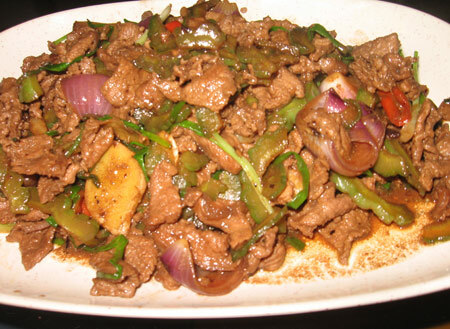 If you go to a Chinese restaurant and most of the ingredients are prepared, this dish will not take the chef more than 5 minutes to cook it. The secret lies in the really big fire from the stove and the skill of the chef to “work the wok”. You need strong wrist and quite sometime to master this “work the wok” skill. I bet I will burn all the food if I were to use a Chinese restaurant stove with really big flames. But for now, I will just be contented with my dish fried on a normal house hold kitchen stove. And I think my pictures are getting better…hahahaha. Hahahaha. Im not too bighrt today. Great post!